hello everyone, a friend of my father really liked me and knew i was a musician and i was really getting into recording at the time and i told him about it while he was visiting us. well when he got back home he decided to send me his tascam 388 in the mail from Texas. so now i have this board but i have no idea how to use it and i really wish i did because i love the analog sound. if anyone could show me where to find a manual or any other material on running an analog board i would be very thankful. 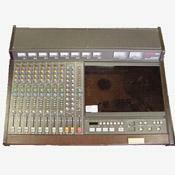 The Warmth,reversing ability,real studio mixer feel.,digital counter, clear cur array,easy outboard hookup, You won't see anyone running down the block with one, Because of the two motors it stayed precise almost no drift. It's easy to operate if you know how to run an old two track. It's pretty much like that with a mixer. If you like Analog . This was probably one of the last good reel-to-reel home 8 track decks they made before going to cassettes and digital. Constant cleaning. The parts(Heads etc.) wear out fast with heavy usage. The bill can be high. I bought a 388 around 1991. The machine I have belonged to the drummer of a major league Rock band from San Francisco. The first thing I did was start doing session work for friends as well as designing sn album . meaning..... record the basics on tape and clean it with the computer..I've put 2 1/2 albums together. It actually was fun to learn (at times). Guitars, Bass, Vocals to me were the best. The Drums did ok if you used as many tracks as you could and them bounced them down to two tracks.The Parametric eq took sometime to learn. Even with help. It is heavy 80+ pounds but it's durable and can produce good music but hernias if you try to move it alone..The cover on top keeps dust out which is a maintainence issue. The tones you get are clear and direct and. because of the tape width you do have more headroom..it has a built in dbx.The music all in all came out great. But then the maintainence epair thing became important. I had the heads and motors fixed, calibrated ,some other minor stuff for. about $300 . To me that wasn't too bad the first time. But you do have to stay on top of it with the care. Later I bought a second one because one of the first ones motors finally wore out. The second one wasn't in as good of shape so it didn't last too long . . I got an Adat and striped the 8th track of the second machine and used the first one as a mixer. The mixer seemed to be ok if you didn't do a lot of hard EQ-ing. The original private repair just tired of messing with them. The parts got hard to find and they got exspensive . I' did find a place that fixed them a few years back but the motors are getting more scarce. No one at Tascam can direct me. They just say discontinued. i have a tascam 388 and i'm a little bit lost because the capstan motor is not working and more i lost it a few month ago after trying to make it repaired. i 'm searching one for a few weeks now but it seems to be very very difficult, no spare parts available at any store. High build quality. Flexible and full featured mixer. Analog sound. No wow and flutter. Great tape handling. Great sound. Flexible input and output routing. Looks cool! Heavy, 80 pounds plus (the price you pay for high build quality). Hard at times to get to the jacks on back if it is up against the wall. No phantom power for microphones. Basically a review can give you two things: an opinion, and some specs. I suggest LISTENING to an album recorded on a Tascam 388, your ears should decide. The only one I know of for sure is by a person/band called Rocketship the name of the album is "A certain smile, A certain sadness" Written and recorded by Dustin Raske and its available from Slumberland records. Even if you don't like the style of the music, you get a great sample of drums, bass, guitar, and, various organs, and vocals. Dustin said that he mixed 8 tracks down to DAT and then stereo back onto 2 tracks on the Tascam, leaving 6 tracks for additional overdubbing. There is no reverb on the whole recording. I believe he used a pair of Shure SM 81 condenser mics, and some SM 57's. I know to some it may be wierd to buy an album to see about purchasing a recorder, but think about it, if you hear the recording and respect it, than you know the only limitation is you, at least, and then you can invest your money wisely. Strengths include: Affordable Media (456 1/4" tape on 7" reels is about 10 bucks)... Analog tape distortion! -- You can push the VU's into PLUS 10 (that's 10 dB that you'll never reach in the digital world) and it just sounds great. If you know about tape saturation & noise floor, you'll know it's important to get all of the signal you can onto the tape. This unit will do that... No cross-talk -- I have put a bass guitar on a track directly next to a quiet vocal & it doesn't bleed-over. (it's an analog thing)... -- Very well-built. WEAKNESS: The weight is like 80+ pounds. Tascam quit making them. -- that's a weekness. They jumped into the cassette units & made a bad name for cheap sounding multi-track portables. This guy should have been around longer -- obviously costs too much to manufacture, etc. I have had my Tascam 388 for about 6 years now. I am a producer / singer / songwriter... Since exiting recording school in 1990, I have had a ton of gear filter through my studio. The 388 has been a solid worker as a songwriting tool. It is so simple & strait-forward. Once the tape is loaded, you are ready to rock. One big plus is the pitch control & the obvious fact that you can track in reverse by flipping the tape over. okay... that's a rarely used perk, but you've heard Radiohead's song "Like Spinning Plates" on Amnesiac (2001)? Reverse, baby! better than a more robust format. An Ampex 1" 8 track I believe has this covered. When used judiciously, the Studio 8 can accent a digital studio to bring back the warm dirt that sounds so good on our older recordings. It has a noise reduction(dbxI) defeat on the eighth track as to accomodate your favorite smpte signal. Use it as a master or slave with the optional control unit. It is good for recording Sounds that need to be detailed and expressive. Leads, vocals and live instruments benefit the most. Drums are not it's forte. It's mixer section, while extremely comprehensive is better left bypassed, unless one wants an angry guitar sound. It has a 3 band, sweepable EQ. No Bandwith adjustment is provided. It sounds as if the bandwith is possibly as wide as 3 octaves. I don't exactly know, however; it is a musical EQ. This is a feature seldom found today in our world of Mackies and software equalizers. For an angry fat guitar, one needs to first send a good signal in. Then take the mid EQ and center it on 1khz. Crank the amplitute of this center frequency and it may remind you of something from "Revolver" even without an AC-30. With a simple, raucous boost of this band, one can bring up all of those sidebands, crosstalk, resister noise and all of that filth that those digital gurus said would clog your arteries. Don't get me wrong, digital has it's place, it just is in it's infancy and only the best products perform with any dignity. Analog and digital go hand in hand. Eventually, all electrical signals end up in some form of analog transducer, so we mustn't move into one of two camps. An analog 388 can give a small digital studio a real advantage. Actually, a signal first processed by a digital mixer such as a Yamaha Pro-Mix and tempered direct to tape into a 388 would be ideal.-like recording a keyboard. As with any studio product, one must always be concerned with gain staging and what not. Don't try to use the mixing section(although very comprehensive) of this board as your main board. It's better just to use this machine like as if it is a stand-alone 8-track with some EQ options. As an analog product, it should be reconditioned prior to use. It must be taken care of, i.e. demaged, cleaned and calibrated to spec. I've had fun with this machine. It's too bad Teac abandoned it for the cassette format. I've seen these priced under $1,000.00. I think it weighs over 80 lbs and is awkward to lift. Bring a friend to help you carry it. Enjoy.